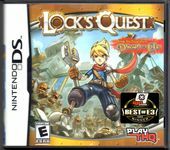 Lock's Quest is a real-time strategy game, incorporating tower defense gameplay elements. The battlefield, viewed from an isometric perspective, is displayed on the DS's bottom screen. Combat is divided into two phases, Build and Battle. During the Build phase, the player has a limited amount of time and resources to construct defenses, which consist of walls, towers, cannons, machines, and traps. Once the Build phase ends, the Battle phase begins. Lock can repair damage to the defenses or fight enemies, with each action having a corresponding minigame. Both battle phases make good use of the touch screen, as the player can utilise sliding and twisting movements with the stylus to activate various upgrades and abilities. The game world revolves around "Source", a mysterious substance. Lord Agony uses it as fuel to create his evil clockwork army, while "archineers" use it to build defenses. When the clockwork soldiers attack Lock's town, he defends it until the populace can escape, and loses track of his sister. Lock sets out on a quest to find her and defeat Lord Agony. Eventually he joins the army and fights to all of the directions (North,South,East,West). He returns to his home willage to find his sister where they escape only to find out their grandfather is agony. Apparently they were both machines but lock was given "The spark of life". Source: Wikipedia, "Lock's Quest", available under the CC-BY-SA License.